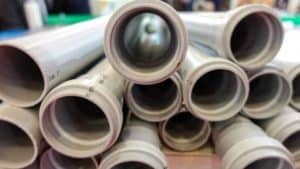 Pipe noises range from loud hammering sounds to high-pitched squeaks. The causes may be loose pipes, water logged air chambers, or water pressure that’s too high. Anchoring exposed pipes is a simple solution; other remedies such as anchoring pipes concealed inside walls, floors or ceilings, may call for a professional. When you anchor a pipe-especially a plastic one-leave room for expansion. Don’t use galvanized straps on copper pipes. Only hot water pipes squeak. As the pipe expands, it moves in its strap, and friction causes the squeak. Solution: Cushion it as you would a banging pipe. Remedy: To restore air to the chambers, turn off the water at the main shutoff valve. Open all the faucets to drain the system. Close the faucets and turn the water on again. The air chambers should fill with air. Water pressure that’s above 80 psi (pounds per square inch). Remedy: To lower the pressure, install a pressure-reducing valve (you can call in a plumber to do the work if this is a job you don’t want to do yourself).